About meI live in Hertfordshire, England. After specialising in Latin, Greek and Ancient History at school, I graduated in Modern History from Durham University and then worked for over 30 years in Banking in the City of London. However, I now think that I would have been much more fulfilled if I had become an archivist or librarian. About my libraryI have loved books for as long as I can remember, both for their content and also as beautiful objects in their own right. I believe that if a book is worth reading it's worth owning and consequently my library continues to expand in inverse proportion to my wallet. The books now number around 5000 and recently had to move to a shed at the bottom of the garden, allowing my wife and I to continue living in the house. 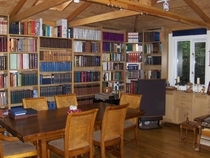 The library is divided roughly 50/50 between fiction and non-fiction. Much of the non-fiction consists of History (both ancient and modern) and literary matters. I am currently cataloguing on LT and am now in the high hundreds. I have finished cataloguing most of the Ancient History and a fairly extensive Bible collection (I'm agnostic, but really interested in why religion is so pervasive). Now, I've embarked on several hundred books on aspects of more modern history. Lots more after that! At the present rate of 500 books a year, I estimate another 8 or 9 years. My TBR pile goes up at nearly the same rate.